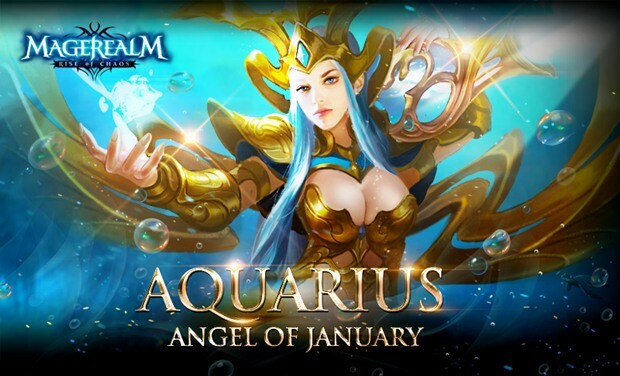 Magerealm, GTArcade’s unique 3D action MMORPG, is excited to introduce a new Angel to the Realm -Aquarius, the Angel of January! As the latest Angel to answer the Mage Council’s call to arms, Aquarius is a mysterious being that has rarely participated in the affairs of men. But when the evil corruption finally reached her secluded oasis, Aquarius had no choice but to fight back. Known as the Caller of the Tides, Aquarius is blessed with absolute mastery over water. With a mere flick of her wrist, she can shape and bend the torrents to her will. From her Mystic Urn, an artifcat of great power handed down by her ancestors, Aquarius can summon an endless surge of water, allowing her to wield her powers at any time. While Aquarius prefers the path of least resistance like the water she commands, she is fiercely protective of her friends when the need arises. Aquarius’ greatest power is the ability to create a swirling torrent of water around her allies. This moving barrier acts on its own to absorb damage by deflecting attacks while also conturing to her allies’ weapons to enhance their attacks. Aquarius is a balanced Angel that can provide both protection and attack power for your entire team!